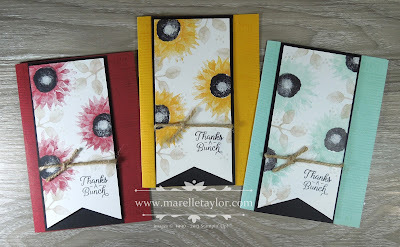 I'm so glad this Painted Harvest stamp set is on the Carryover List! That means you can still order it, and it might even appear in our next Annual Catalogue. The bundle, however definitely won't be, so now is a good time to grab that! Who says sunflowers have to be yellow? I think they look just as pretty in Cherry Cobbler and Pool Party!